DASSART™ : Honored to be the inaugural art workshop at the new Milagros Arts Center, Prescott, Az. July 2016. Creatives converged for the workshop at the Milagros Arts center. Artists from Florida, Texas, Arizona,Colorado Seattle, etc. We all had a blast! Bonny at the evening "Double Exposure" lecture. Some great artist work is in the foreground. BRAVO! I made 2 new FRANKINCAMERAS from patina plates and found objects..These 1/1 constructions are clever disguises for Iphones. and MOMENT lenses ( wide ) .. I use a photo booth app (pocketbooth) and take them to gallery openings and art events.. Who isn't amused by the weird musings of artists left to hammer and invent objects to embellish their own weirdness.. This is SWAMPCAM--#6 , cobbled from a green Kodak folding camera body , c.1920s. It may have been a Girl Scout green edition, which is even more appropriate, as, yes, i admit to that association until i was in high school.. LOVED all that arts and crafts and hands on camp construction stuff. YES, it is an actual dried gator head, bromeiliads , moss and sea sponges to look like branches and logs.. I made another, a bit less extreme, for BONNY LHOTKA, as a birthday 2016 gift, which she played with at the P.I.E. conference, Carmel Ca. SWAMPCAM #6 and BONNYCAM #5. Only non functional camera parts are used.. Original patina aluminum plates cover a wooden box. 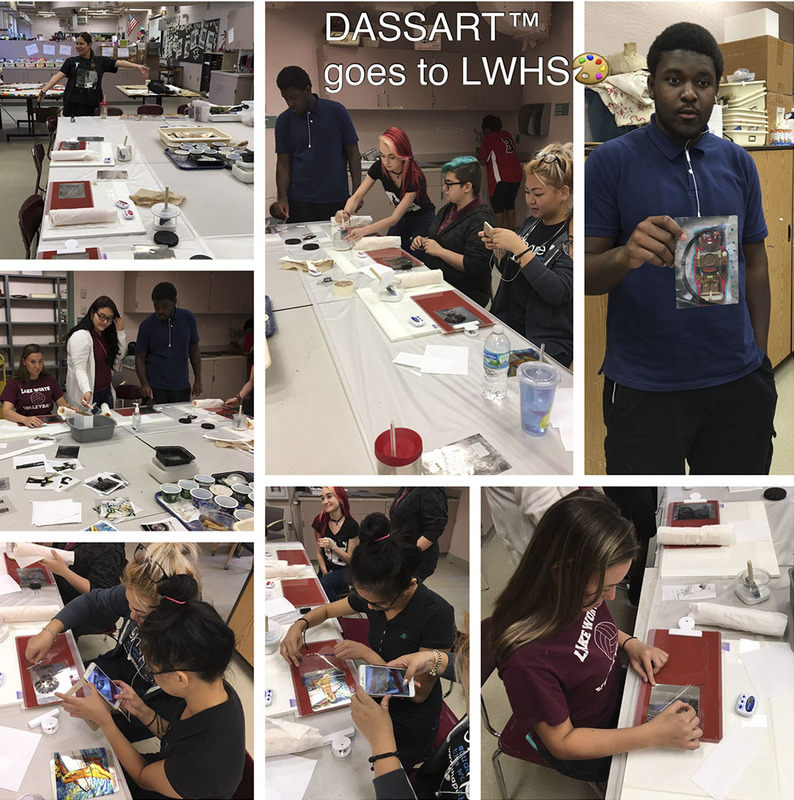 There is a space built in to hide the Iphones..
220 Lake Worth High School art students learned the DASSART™ image transfer process with WonderSauce™ . BONNY LHOTKA coaches creatives in the fine points of archival image transfer at the TINTYPE TAKE OUT, walk-through workshop. 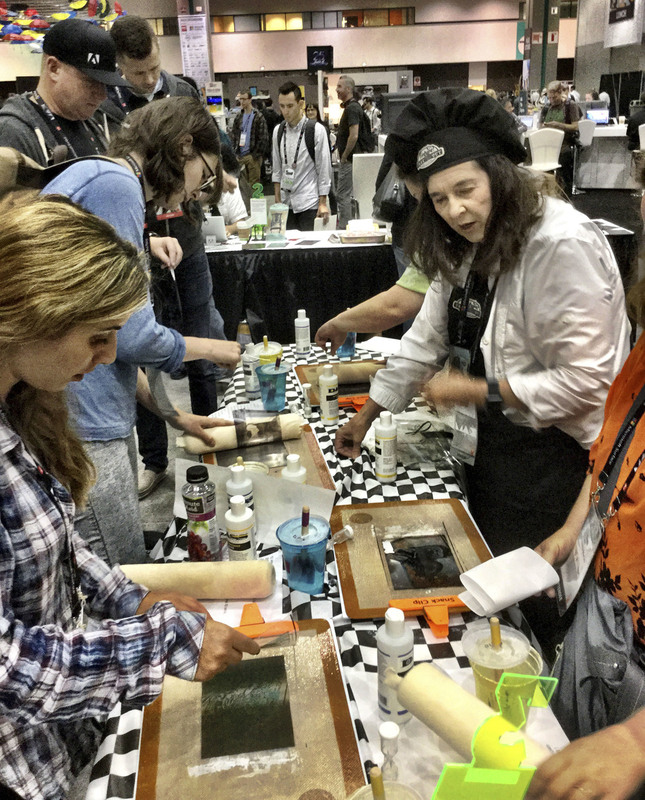 BONNY LHOTKA, invited artist/inventor of the DASS™ archival image transfer systems, helped ADOBE conference attendees accomplish an incredible 1500 images on 5x7" patina cooked aluminum plates!! I was part of the DASS team that fostered folks through the "TINTYPE TAKE OUT", a unique walk-through workshop , showcasing the transfer process with WonderSauce™. OMG! There are plans for another pre-conference adventure at this years' ADOBE MAX CREATIVITY CONFERENCE, San Diego, Ca. Oct. 2016. Stay tuned for upcoming 2018 event schedules ..
DASSART™ workshop at EASTMAN HOUSE 2018 event . OLD SCHOOL SQUARE, Del Ray Beach , Fl. 33444, 561-243-7922, FL,. "METAL TO MAGIC", one day workshop, 10x pigment images printing included.. 7 artists. 101# WONDERSAUCE™ , transfer to metal, acrylic, and the new DASSART™ YUPO .. 9:30am-4:30pm, $165.00 class fee plus $55.00 materials fee. ALTERNATIVEPHOTOTRANSFER WORKSHOP 2018 greater CHICAGO area, location to be announced. ALTERNATIVEPHOTOTRANSFER WORKSHOP 2018, AUSTIN, TEXAS 2017, location to be announced.